Are you looking for a thrill? On a path for some of the most scenic biking trails in North America? 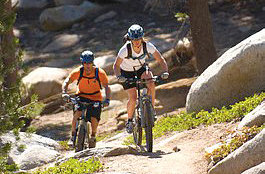 South Lake Tahoe biking trails come in all levels from beginners to extreme experts. Want an easy mountain bike trail to get you warmed up and enjoying the great Tahoe forest setting then the Powerline Trail is the perfect match. Mr. Toad’s Wild Ride will deliver for those challenge seekers and the Lake Tahoe Flume Trail is great for beginners and intermediate riders. The views draw riders from all over just for the experience. A must for mountain biking enthusiast.